At GUAY, your professional development is important to us. We are a growing company based in Québec. We offer an innovative, stimulating, people-focussed work environment as well as competitive salaries and many employee benefits. We are always looking for great candidates! A remarkable success for more than 50 years! GUAY is a Québec-based company founded during the Quiet Revolution. Over the years, it has successfully grown to become one of Québec’s economic leaders. The man behind this success story is Jean-Marc Baronet, an ambitious visionary who set his sights high from the beginning. In 1964, this young Québec entrepreneur was the owner of Machineries Provinciales Inc., which distributed different kinds of heavy equipment, including cranes. He identified an untapped market for a company that could provide a comprehensive crane services throughout the entire province. He created Armand Guay Inc., borrowing his brother-in-law’s name. The choice of this name was purely strategic, and it was later changed to Guay Inc. in 1988. The company founder never waited for business to come to him. If a new kind of crane was introduced, he found the markets in which to use it, always keeping one step ahead of the competition. For more than 50 years, the GUAY name has been ever-present on building sites all over Québec and even beyond. The company helped build the Ultramar refinery in Saint-Romuald, the Pont Pierre Laporte, the Complexe G, the Hilton Hotel, Man and His World at Expo ’67, the Olympic Stadium and the Vélodrome for the 1976 Summer Olympic Games in Montréal, hydroelectric projects in James Bay, wind farm projects, the Lauralco and Alouette aluminum smelters, paper mills, MIL Davie, both the Québec and Montréal ports, and the Confederation Bridge to PEI are just some of the projects upon which Guay left its mark. Not to be forgotten is the one project that was its proudest moment, when NASA asked the company to raise the space shuttle. 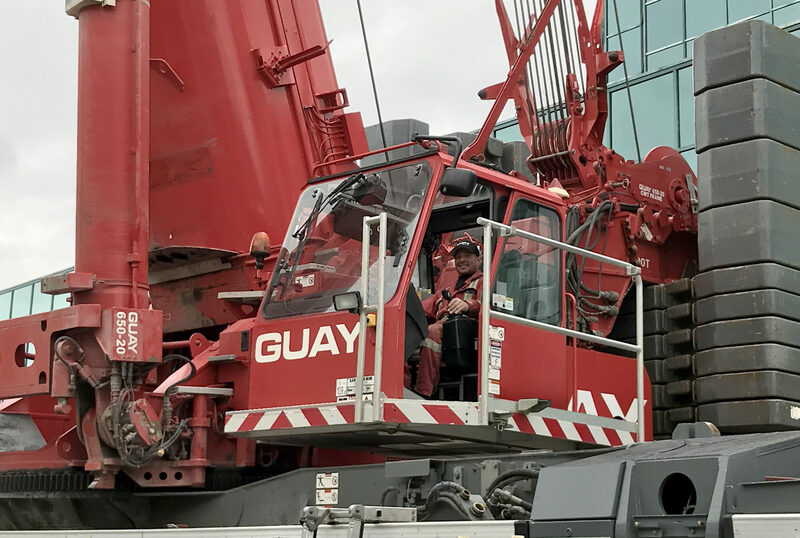 Guay Inc. continues to invest significantly in its equipment and maintains a cutting-edge fleet to meet its clients’ demands and needs. The company has always enjoyed well-planned, sustainable growth because of its vision when choosing equipment, setting up new locations, or when acquiring its competitors. Only .doc, .docx, .rtf, .txt and .pdf files are accepted. Limit of 2 MB per file for up to 3 files. Did you know that Guay employs more than 500 employees?